Click the tab headings below to learn more about resident and non-resident OHV registration requirements in New Mexico. 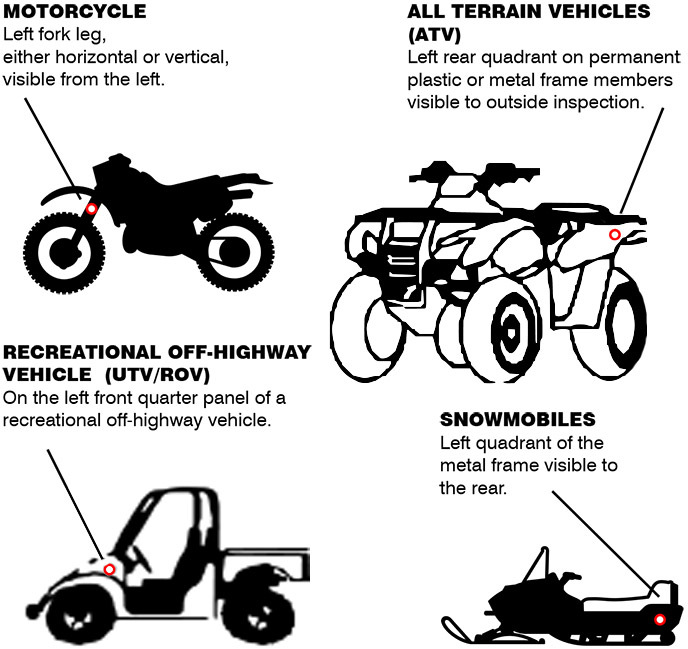 ATVs and ROVs intended to be operated on authorized paved roads must ALSO display a special OHV paved road use decal or plate in addition to the OHV registration decal. At this time, non-residents may purchase the OHV paved road decal through the NM Game and Fish Online Licensing system. 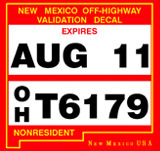 Non-residents whose ATVs and/or ROVs that comply with New Mexico’s paved road use requirements and displays a valid paved road use decal or plate from their home state, are not required to purchase a New Mexico non-resident paved road use decal or plate. 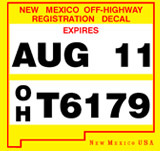 NM residents must obtain decals or plates for their OHVs by contacting their local Motor Vehicle Division office. New Mexico residents are required to register their OHV at any Motor Vehicle Division Field Office. Contact: New Mexico Motor Vehicle Division (MVD). New Mexico requires state residents to have a mandatory registration for all OHVs used on public lands, and the display of a validation decal. Registration is required for OHVs prior to using on any public lands in New Mexico and must be displayed. All OHV riders from out of state require a permit on public lands and display a validation decal. Nonresident permits can only be purchased online with a Visa or Mastercard. *Two-year permit must be renewed every two years from the date of initial registration. * Non-residents who have proof of a valid OHV registration, user fee or similar fee, may not need to purchase the New Mexico Permit. Please check the Fee Exceptions tab for a listing of those states. Contact: New Mexico Department of Game and Fish or any New Mexico Department of Game and Fish office. *** With the passage of SB 379, the Off-Highway Motor Vehicle (OHV) law changed the requirements of non-residents who need to purchase a non-resident permit. The new law now recognizes a non-resident operating an OHV is in compliance with New Mexico if that person: is currently in compliance with another state’s off-highway vehicle registration, user fee or similar law or rule demonstrated by certificate of registration, permit or similar evidence…(66-3-1004.C NMSA 1978). A non-resident with an OHV from one of these states must purchase either the 2 year non-registered permit sticker for $48.00 or the 90 day permit sticker for $18.00 prior to operate on New Mexico’s public lands. A non-resident from the remaining states need not purchase New Mexico ‘s permit as long as they can provide valid proof that they have a current registration, user fee or something similar for their off-highway vehicle. If a person cannot provide valid proof of possessing such a document then they must purchase the 2 year non-resident permit sticker or the 90 day permit sticker. It is a misdemeanor for any person (even a juvenile) to fail to possess the proper permit or registration for an off-higway vehicle and display the required decal on their OHV. Persons in violation of this provision can receive a fine of $60.00 or more and may not ride on public lands. A member of the U.S. Armed Forces who is assigned permanently to a military installation located within New Mexico has 30 days to obtain a Resident OHV permit from the Motor Vehicle Division of New Mexico. If temporarily assigned and New Mexico residency will not be established a 2-year or 90-day nonresident permit can be purchased if no other valid registration permit is in place from another state. 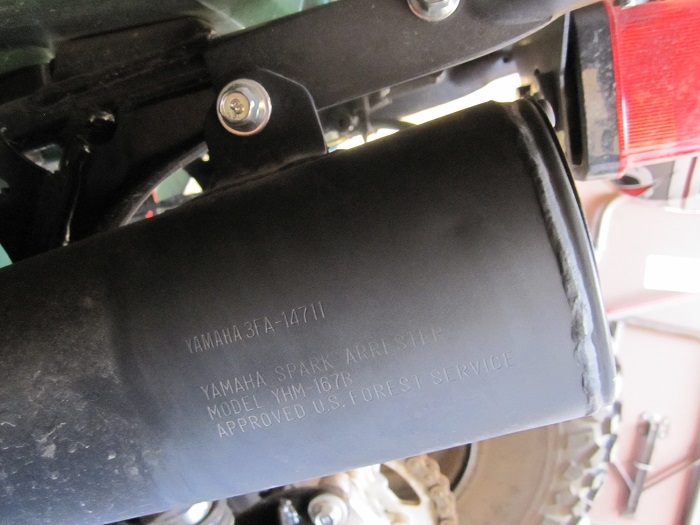 In addition to your valid registration, a U.S. Forest Service approved spark arrestor is required to ride on public land. The muffler on your off-highway vehicle should have a stamp showing U.S. Forest Service approval as shown here.